Hiring snow plow contractors is pretty easy, the hard part is making sure they deliver the services you need and are looking for. The price will vary based on the size and length of your driveway. Also whether you need the sidewalk cleaned or the steps up to your home cleared of snow. The basic price will only include removing the snow from the driveway. The snow clearing work will be completed based on their schedule. Your time to negotiate and set the price for the services they will deliver is before you sign the contract. Definitely before you pay your fee. After you sign the contract, the price goes up for any additional services. As a result make sure that you have everything clearly understood before you sign. Also that it is included in the contract you are signing. For most people this is making sure the snow is cleared from their driveway so they can get their car out of the driveway in the morning after a heavy snowfall. However snow plow contractors are in the business to make money. The timing of when your driveway is actually cleared of snow will depend on a number of factors. For example how much equipment do they have and what is the customer / equipment ratio? Do they have a typical route that they follow and where are you on that route? If you are at the end of the route, you may not have your driveway cleared when you need it to be cleared. Do they follow the snow plow route? In other words if the snow plow does not go down your street until late in the day, does that mean your driveway is not cleared of snow until after the street has been cleared? Consumers really need to understand the service that is offered. Some will only clear the driveway after the snowplow goes down your street! Many companies will only do the driveway and not clear your steps. Some will only clear snow from your driveway when there is more than an inch of snow. If you are unsure about what services you are going to pay for, prepare a list of questions ahead of time and review each of them with the operator before you sign the contract. Once the contract is signed, you get whatever the fine print says in the contract. The standard service may include clearing your driveway after the snowplow has passed and only the driveway. 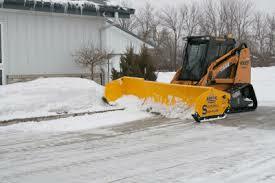 If you want more than this level of service some snow plow contractors will offer premium services at higher prices. It is up to the consumer to decide how much they want to pay. Also the level of service they want. They also need to make sure that it is covered in the contract. In addition you want to understand if the snow will be cleared off the sidewalk or the steps to your home. Make sure you understand where this snow will be placed. If it is thrown on the driveway and later cleared by the snow plow, this is probably fine. If the snow is thrown on top of your shrubs, they may get crushed from the snow on them. Make sure that these concerns are specified in the contract so that there is no confusion. While some of these things may seem too detailed to be in a contract, unless they are written down, it will be virtually impossible for the operator to recall all of the special instructions regarding each property they are clearing snow for. Also if it is in the contract and you are dissatisfied with the service, you have the contract details to fall back on for discussion and enforcement. When consumers do their homework and the contract is clear, there will be far less issues and disagreements because everyone will fully understand all of the expectations for the coming season of snow clearing.